Obviously by this time, Jerusalem was in trouble. They’d nearly reached the fulness of iniquity, and had become ripe for destruction. It takes a lot to get to that point, but it happens repeatedly throughout the scriptures. 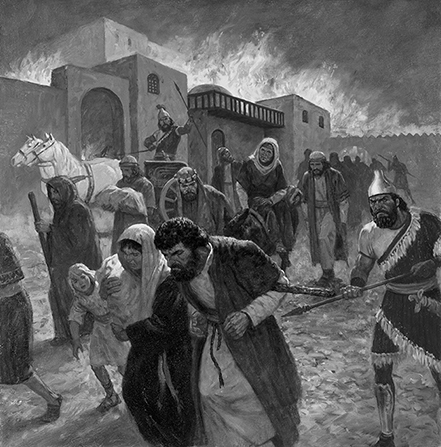 For Sodom and Gommorah, it was (among other things) moral transgression and violence, for the Nephites and Jaredites it was secret combinations and violence, for the people of king Nimrod (the brother of Jared’s time in the kingdom of Babylon), it was secret combinations and rebellion. There are always multiple layers of wickedness, but there are common threads of rejecting prophets, turning from the truth, and persistently disobeying God, to the point where children growing up the society have no chance for a moral, righteous life. God’s destruction that comes of the fulness of iniquity is an act of mercy, albeit a last resort. 1 Manasseh was twelve years old when he began to reign, and reigned fifty and five years in Jerusalem. And his mother’s name was Hephzi-bah. Obviously, the leaders of the people led out in this rebellion, idolatry, and iniquity. But entirely letting the people off the hook wouldn’t be appropriate, either. Often, political wickedness (in their time as well as ours) is a reflection of the popular ideas of the time–practices that are generally accepted despite being wrong. I doubt these kings were acting against the will of the people in their actions. More likely, they are doing the wickedness as a political move to gain the favor of the people. We discussed more about the condition of Jerusalem in the commentary to 1 Nephi 1:4. …That it should be destroyed, and the inhabitants thereof; many should perish by the sword, and many should be carried away captive into Babylon. This was literally fulfilled, and we have several records of it in the Bible. 4 ¶And it came to pass in the ninth year of his reign, in the tenth month, in the tenth day of the month, that Nebuchadrezzar king of Babylon came, he and all his army, against Jerusalem, and pitched against it, and built forts against it round about. 8 ¶But the army of the Chaldeans pursued after the king, and overtook Zedekiah in the plains of Jericho; and all his army was scattered from him. 15 Then Nebuzar-adan the captain of the guard carried away captive certain of the poor of the people, and the residue of the people that remained in the city, and those that fell away, that fell to the king of Babylon, and the rest of the multitude. 4 ¶And the city was broken up, and all the men of war fled by night by the way of the gate between two walls, which is by the king’s garden: (now the Chaldees were against the city round about:) and the king went the way toward the plain. 22 ¶And as for the people that remained in the land of Judah, whom Nebuchadnezzar king of Babylon had left, even over them he made Gedaliah the son of Ahikam, the son of Shaphan, ruler. Unfortunately, this was the last time the Jews would rule their own country of Jerusalem until the 1900s AD. This destruction and carrying away into Babylon also marked one of the major stages of the scattering of the tribes Israel. This entry was posted in Book of Mormon, Book of Mormon: Verse By Verse Commentary, Fullness of Iniquity. Bookmark the permalink.